This space saving flower pot rack adds a touch of country rustic style .3 Tiers freestanding planter shelf worked as an organizing shelf, shoes storage, bathroom organizer to store,organize and display potted plants and other decorative items indoor outdoor on your patio, greenhouse, deck. Please take care when install , make sure that all holes are aligned between the panel. There will be slight crack, burr on the bamboo made products due to the bamboo material properties,It is normal phenomenon. Every products has been inspected before delivery,If any problems,please contact us,We will reply you within 24 Hours. 【DURABLE BAMBOO】The flower stand is made of 5 YEARS natural bamboo in high mountains.It is MOTH-RESISTANT,durable after the high-temperature carbonization (200℃). 3 polishing process and Eco-friendly varnish treatments makes the flower display stand surface smooth,WATERPROOF,easy maintain.Fine bamboo texture adds an elegant display to your plants that goes nicely with the hues of nature.With proper waterproof ability,it can be used INDOOR OR OUTDOOR at least 10 years. 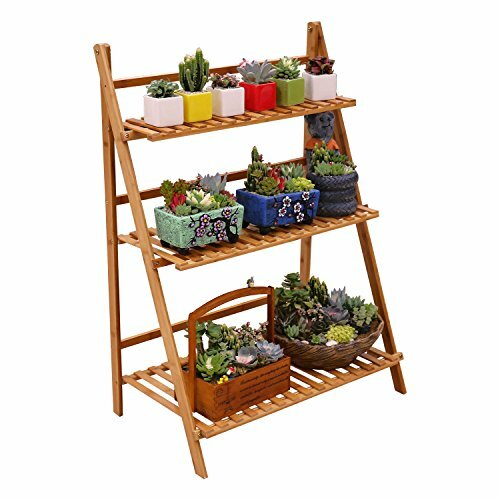 【LADDER DESIGN】Three tier corner planter stand,weight 9.5lbs,withstand 115lbs.With 27.6in width,37.8 Height,MAKE FULL USE OF SPACEspace;3 levels of Depth and height at 7 in, 11 in and 15 in,allow you place VARIOUS SIZE PLANTS like succulents,herbs, cactus plants,also medium large size flower pots.Multi-Tierl design,not only beautifully display flowers,but also help plants get more sunlight and grwo better without shield each other.TRIANGLE STRUCTURE,improving the plant holder STABLE ability. 【MULTI-FUNCTION USAGE】The multi-purpose decorative flower stand WEIGHTS 9.5 lbs, each layer withstand 30 lbs. It is not only a free standing FLOWER RACK , but also a STORAGE RACK in living room, kitchen, balcony, garage, cabinet, garden, patio,porch and flower shop for storage of toiletries, towels, sundries, decorations,clothes, furnishings, shoes, books, toys and small appliances.In addition,it can be also as a DECORATION GIFT for family,mom,and friends on Mother's day,Christmas,Day. 【FOLDING PORTABLE DESIGN】SPACE-SAVING foldable tiered plant stand can be EASY FOLD if long time no use.It is simple and light,,easy to fold and open within 1 minute,even for a girl; Portable design,convenient to move around.Install tools,manual,garden tools are included in the package.In addition, extra screws are prepared. The flower stand is easy to assemble within 15-30 minutes.If the product you received with quality problem,please contact with us for FULL REFUND or REPLACEMENT . If you have any questions about this product by Ufine, contact us by completing and submitting the form below. If you are looking for a specif part number, please include it with your message.